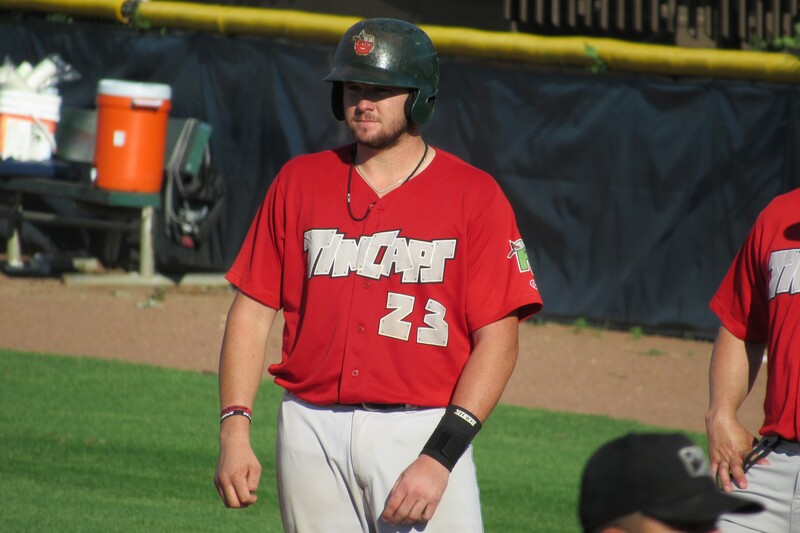 Fort Wayne TinCaps catcher Austin Allen went 0-for-3 Saturday, ending his franchise-best hitting streak at 24 consecutive games. But his sacrifice fly in the bottom of the 9th inning tied the score, setting up pinch-hitter Tyler Selesky’s walk-off single to beat the Bowling Green Hot Rods 2-1. Allen set the new Fort Wayne record Friday, surpassing the previous mark of 23 consecutive games by Sean Burroughs in 1999. He remains tied with former Lake County Captains catcher Francisco Mejia for the longest hitting streak in the Midwest League this season. The longest hitting streak in Midwest League history is 35 games, achieved in 1977 by Waterloo Indians second baseman Tony Toups. He batted .285 with 16 HR, 82 RBI and 12 SB in 133 games with Waterloo, and played his final season in professional baseball the next year. TinCaps reliever Corey Kimber got the win in Saturday’s game after pitching 3.2 hitless innings. Hot Rods starter Jose Mujica got a no-decision despite giving up only five hits while walking none in seven scoreless innings. Francisco Mejia, now with the Lynchburg Hillcats of the High-A Carolina League, extended his hitting streak to 50 games Saturday — with an assist from the official scorer. Mejia originally went 0-for-4, reaching base on an error in the 3rd inning and on a walk in the 9th inning. More than an hour after the game ended, the error was changed to a double, reviving the catcher’s hitting streak. Mejia is now tied for the fourth-longest hitting streak in Minor League Baseball history and the fifth-longest in professional baseball history (including Joe DiMaggio’s 56-game hitting streak for the New York Yankees). It is the longest hitting streak since Roman Mejias’ 55-gamer in 1954 and is 19 games shy of the record set by Joe Wilhoit in 1919. The Bees beat the LumberKings 1-0 in Burlington on Saturday, ending Clinton’s winning streak at eight games. LumberKings starter Ronald Dominguez pitched a complete game, striking out nine while giving up only one run on six hits and no walks in eight innings. Matt Thaiss drove in the game’s only run. The LumberKings have a five-game lead over the Cedar Rapids Kernels in the Western Division. The Bees and the Quad Cities River Bandits are tied for third place, eight games behind the LumberKings. Earlier in the day, the Bees announced their player-development contract with the Los Angeles Angels was extended through the 2018 season. This entry was posted in Bowling Green Hot Rods, Burlington Bees, Carolina League, Cedar Rapids Kernels, Clinton LumberKings, Fort Wayne TinCaps, Lake County Captains, Lynchburg Hillcats, Midwest League, Quad Cities River Bandits. Bookmark the permalink.